20% Off Admission + No Service Fee! Buy Tickets at 20% Off + No Service Fee! 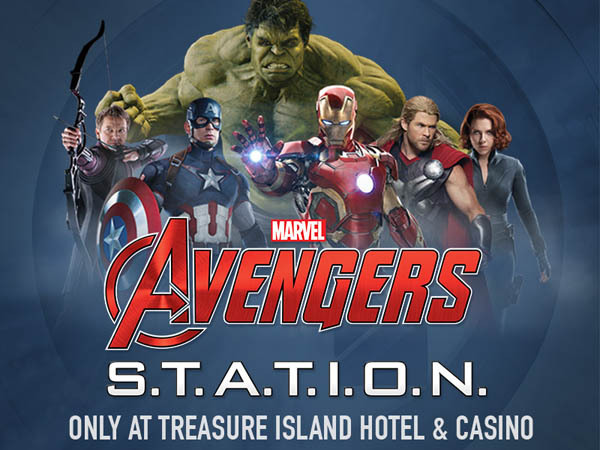 Booking Instructions: Purchase tickets online to receive 20% discount on adult or child general admission tickets to Marvel Avengers S.T.A.T.I.O.N. Discount will appear at check out. Coupon is good for up to 8 tickets. May not be combined with other offers. Marvel’s Avengers S.T.A.T.I.O.N. is an interactive experience bringing visitors into the world of Marvel’s cinematic universe of The Avengers. Visitors will have access to intelligence files & experiments that explore the history & scientific origins of the characters. Come see Iron Man’s Hall of Armor, Captain America’s uniform & shield, Bruce Banner’s lab, Vision’s birth cradle, Hawkeye & Black Widow uniforms and weapons, and more. At the conclusion of the experience, new S.T.A.T.I.O.N. agents can purchase their personalized ID badge at the world’s largest Marvel Avengers retail store, in case they are ever called upon to save the world! Discounted ticket inclusive of $5 service fee! It is free to self-park or valet at the Treasure Island Hotel & Casino! Great Las Vegas Group Attraction! Host your next corporate event, cocktail reception, or birthday at Avengers S.T.A.T.I.O.N. Group rates available. Please call (702) 794-0046 for information.